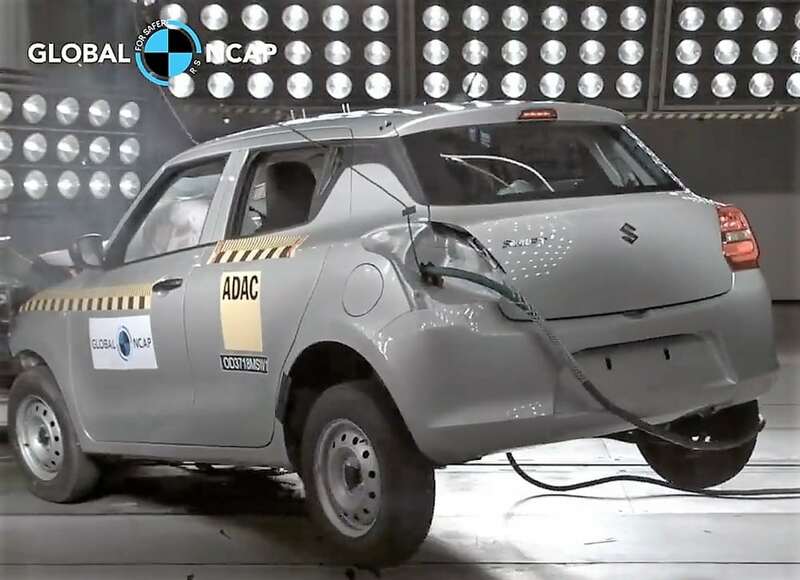 Maruti Suzuki Swift has disappointed the masses by scoring just two stars in the Global NCAP crash test. Swift has recently crowned itself as the most-selling car of India and getting such low score was not expected from their new Heartect platform. The test report mentioned unstable structure as the most happening reason while compression around the driver’s chest and poor feet protection were another two disappointing points for such a low score. Maruti Suzuki Vitara Brezza scored 4-star rating based on the same criteria and thus, proved itself more passenger-friendly than the new Swift. The international variant of Swift was good for three stars, all thanks to the electronic stability control and other mandatory safety features like six-airbags and emergency braking provision. The current generation Swift in India is available with dual front airbags, ABS and ISOFIX child seat provision as standard. Still, the unstable structure of the car brought danger to the chest of a 3-year old dummy and resulted in more than expected damage to the 18-month old front facing dummy. The crash also mentioned the movement of pedal that resulted in damaged feet of the driver dummy. 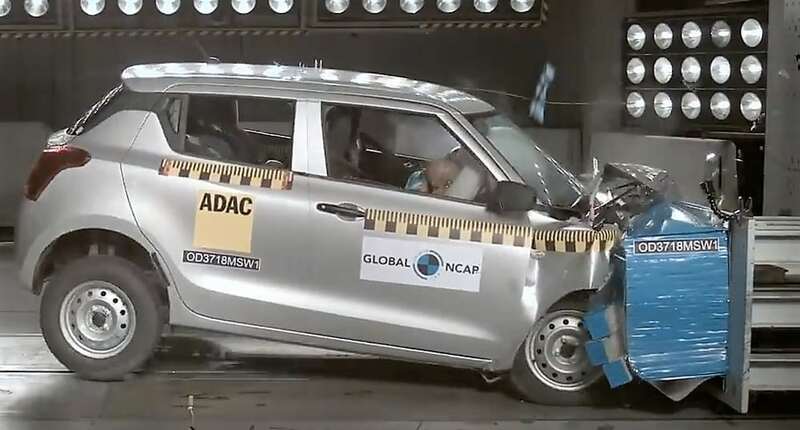 Maruti Suzuki Swift is now safer than the last generation car but still, they have a long way to go before the car meets global standards of safety. 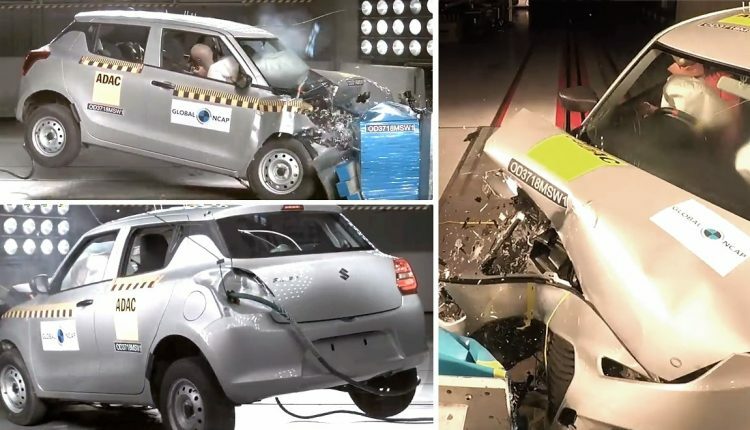 The Indian version had miserable results in the frontal crash test and thus, buyers may need to rethink their preferences with the Swift and other Maruti cars. The new Swift is powered by the same set of petrol and diesel engine as last generation model, producing 75hp in the diesel and 83hp in the petrol variant. Both are available with 5-speed manual as well as AMT gearbox on different variants. The range for 2018 Maruti Swift starts at INR 5.99 lakh.